The Super-Kamiokande neutrino detector is a large water Cerenkov detector for cosmic particles. The detector is a 50,000 ton tank of highly purified water, located about 1000 meters underground in a mine. 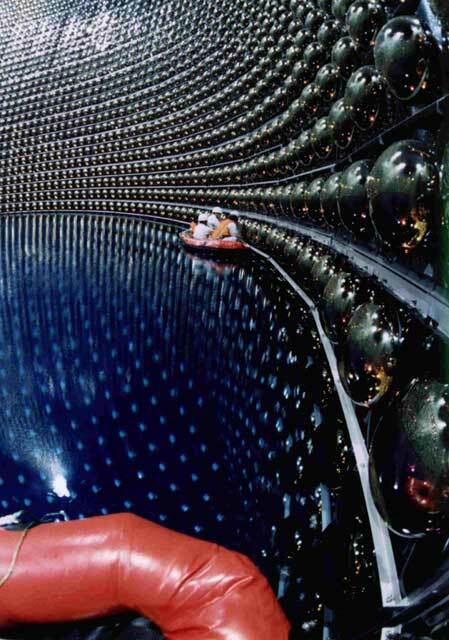 Faint flashes of light given off by the neutrino interactions in the tank are detected by more than 13,000 photomultiplier tubes. The inside is shown here during filling, with boats used to clean the photomultiplier tubes.